dRWR is supposed to implement Random Walk with Restart (RWR) on the input graph. If the seeds (i.e. a set of starting nodes) are given, it intends to calculate the affinity score of all nodes in the graph to the seeds. If the seeds are not given, it will pre-compute affinity matrix for nodes in the input graph with respect to each starting node (as a seed) by looping over every node in the graph. Parallel computing is also supported for Linux or Mac operating systems. When the seeds are given: an affinity matrix with the dimension of n X nset, where n is the number of nodes in the input graph, and nset for the number of the sets of seeds (i.e. the number of columns in setSeeds). Each column stands for the steady probability vector, storing the affinity score of all nodes in the graph to the starting nodes/seeds. This steady probability vector can be viewed as the "influential impact" over the graph imposed by the starting nodes/seeds. The row names of input setSeeds do not contain all those in the input graph. 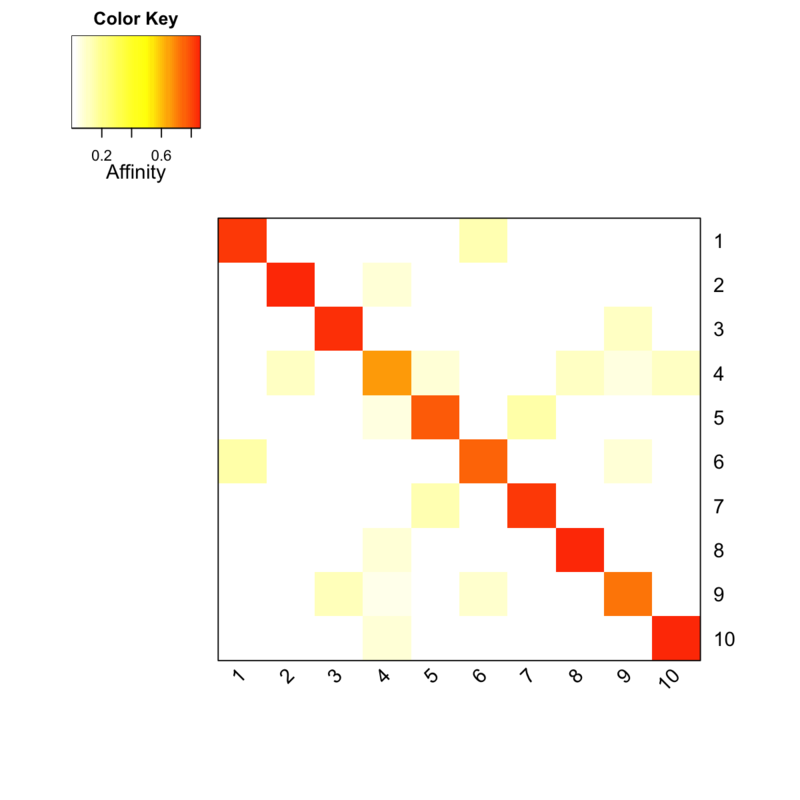 10 x 2 sparse Matrix of class "dgCMatrix"